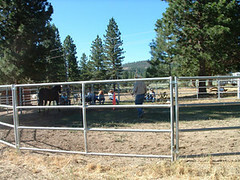 Jack begins clinics with a round pen demo and introduction to his philosophy. 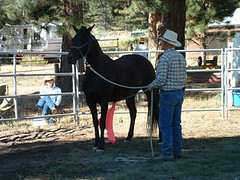 Today she is touched all over with the flag. 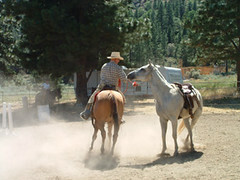 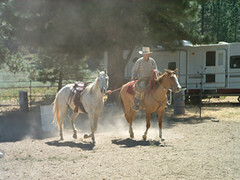 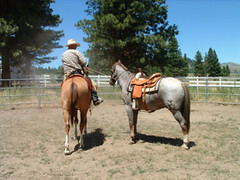 Jack uses Duster for a saddling demo, stressing safety as well as how to easily throw a heavy saddle. 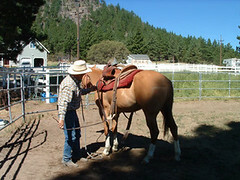 Lower headstall. 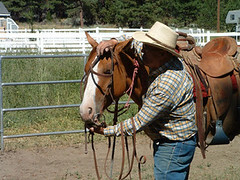 Left hand supports bit below teeth while fingers encourage horse to open mouth. 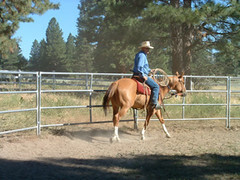 When horse opens mouth, raise bit with right thumb, not by pushing up with left hand. 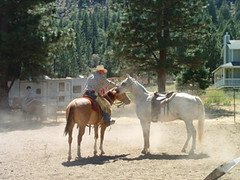 Don't bump teeth! 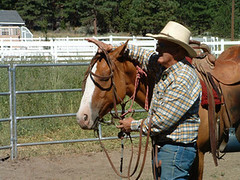 Carefully push right ear under headstall, so if he tries to pull his head away, you have some control. 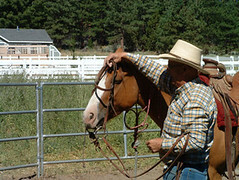 Then gently push left ear in place. 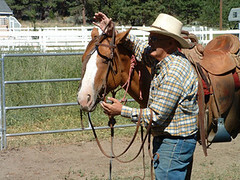 Remove bridle by lowering headstall slowly; don't bump teeth. 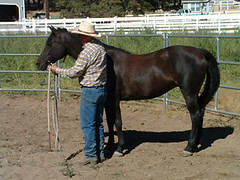 Wait for the horse to spit out the bit. 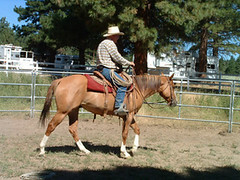 This 20-some-year-old ranch-broke gelding now belongs to a novice rider. 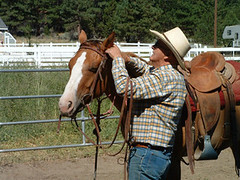 He has enough brands on him to look like a roadmap. 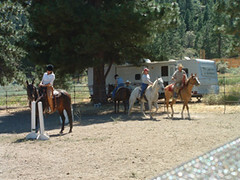 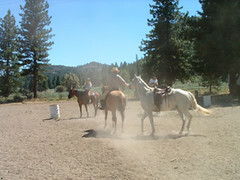 Once Jack established that the horse could be ponied safely around horses in the arena, he had Judy ride while he ponied. 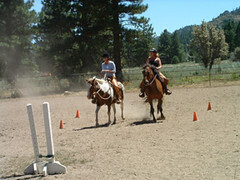 Cheryl and Cindy riding as a pair in the cloverleaf pattern around the cones.